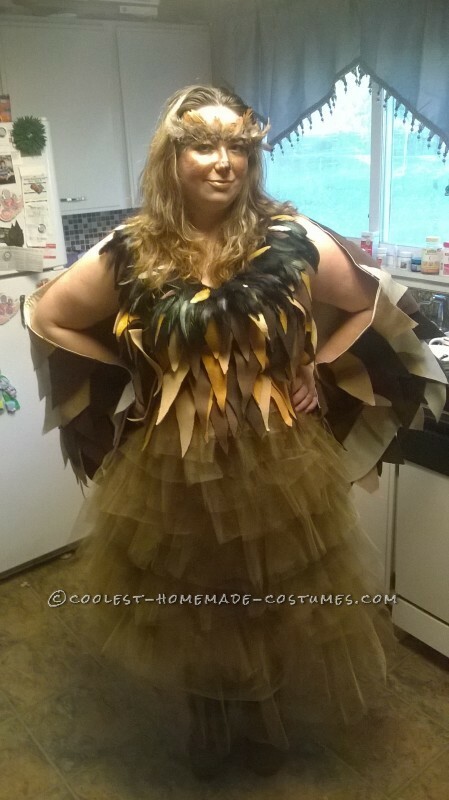 I wanted to have an owl costume that wasn’t all bulky tootsie roll commercial owl but a pretty thing. So I started with a dress from my closet that I love the fit of and pretty much used it as a pattern on some dollar material I bought. 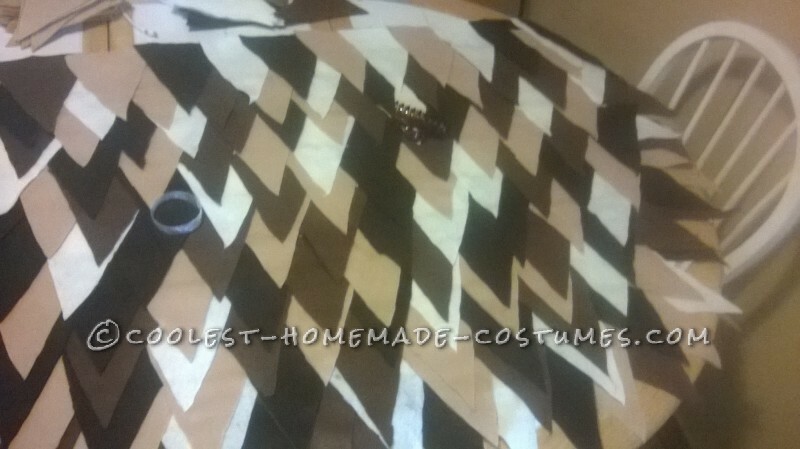 Once I had the bodes sewn up, I knew I wanted to have feathers on it, so I found some inexpensive felt in various colors and cut probably 20 triangles from each color and started sewing them on the bodes starting from the neckline and shoulders down in rows. I left enough room at the bottom of the top to adjust my waistline once the skirt was finished and I sewed them together. Next, I cut out the skirt, again from the pattern I made from my favorite dress. Once I pieced together the skirt, I found some light burnt gold tulle on sale for .50 a yard! So I bought 30 yards of it. I then cut the tulle into strips, probably nine inches wide and started sewing them in circles around and around the skirt cinching them as I went and layering them. It took hours and days; probably a week. I hate working with tulle. Next, I put the skirt on and then the top and had a friend help pin them together where I like the waist line on my dresses, just a little below an empire waist. 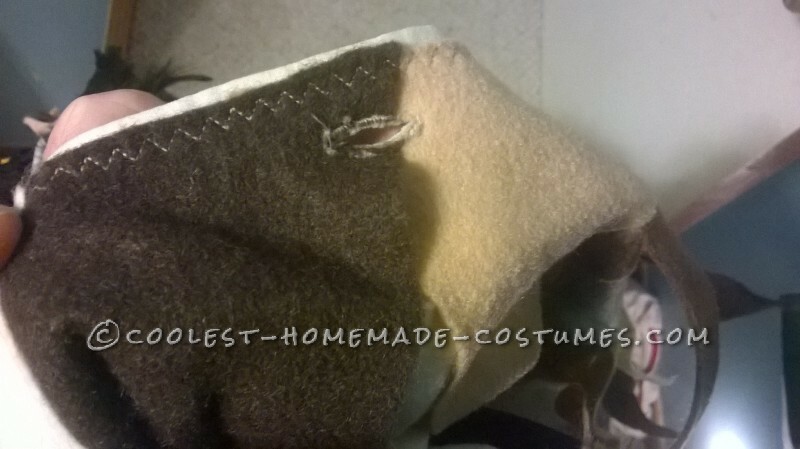 I then turned them with outsides face and sewed them together. 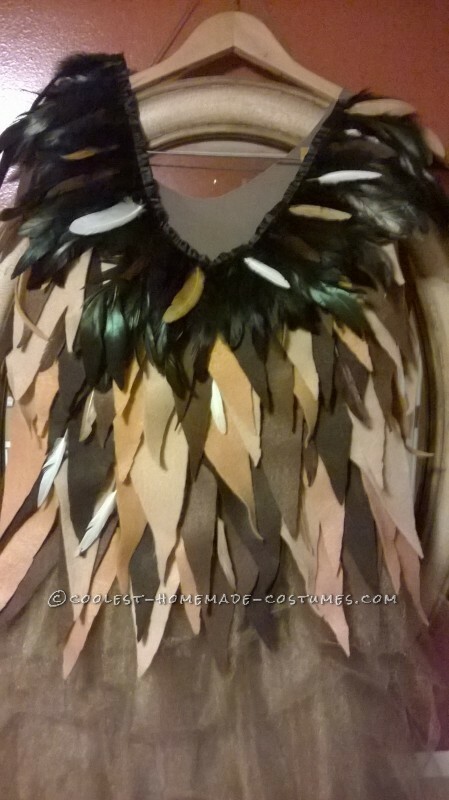 Next, I noticed I had a few feather pieces on the top that just didn’t sit right on the neckline, so I bought some feathers from the craft store and used some ribbon I had and made a kind of necklace with the ribbon folded over the feathers in a row. I had to go easy on that old machine and still broke about two needles on the feathers. 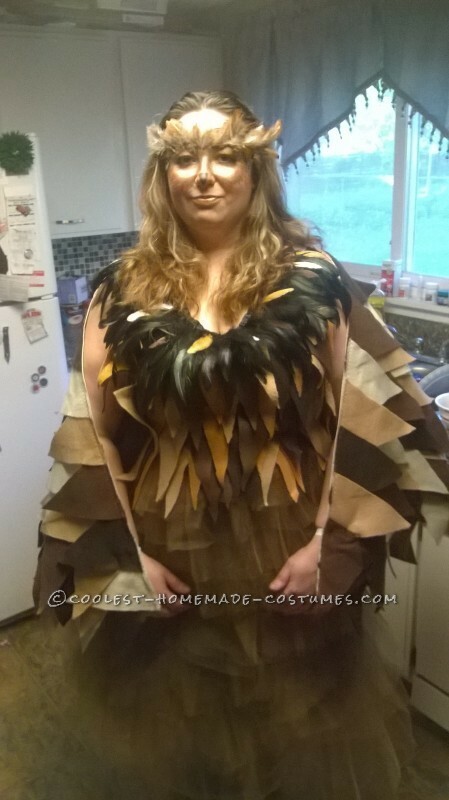 After I decided to pin the new feather neckline to the neckline on my dress and it almost looked a little too vulture-like for me, so I used some colored feathers and glued them on in between the darker ones to give is a little more depth, and sewed it on the neckline from shoulder to shoulder. Next, I knew I needed some wings, so I took a look around the web and found a tutorial for a child’s wings but I embellished upon it and ended up making it more like a cape. After I had the semi circle cut out in two different fabrics, I got some more felt and made more triangles, 294 to be exact. I first sewed the first row but that got old really fast, then I started using stitch witchery, but I had so many to go that I ran through two bottles and there was still half to go, so for a quarter of the price I decided to finish it with hemming tape. I don’t know why I didn’t use it for the whole thing. You just iron the pieces on, on the low steam setting. 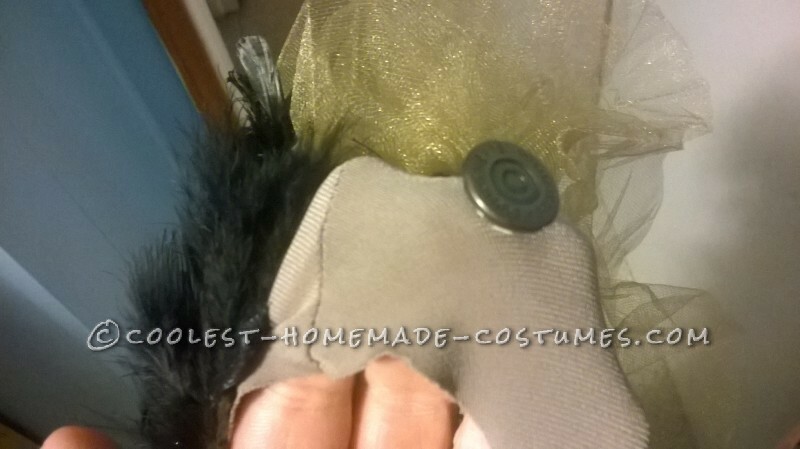 I also decided to add some elastic to where my wrist would fall, so I could just slide my hands through. 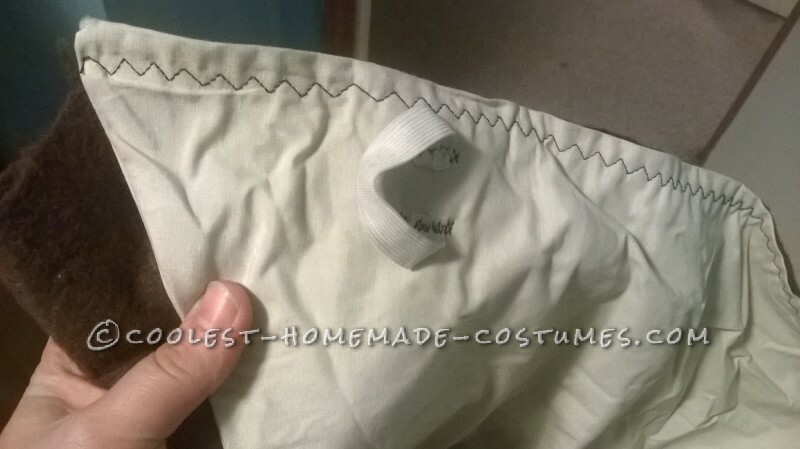 When I finally got done, I decided to line it , and so I used that spare piece I cut from the second fabric and sewed them together and flipped on the neckline so all the seems and glue spots were now hidden. I decided I didn’t want to sew the wings on but I wouldn’t look right as a wrap, so I found some old jean buttons and made a couple of button holes on the top of the wings cape where I wanted it to rest on my shoulders. The buttons themselves were easy. It’s a push the pin up through the bottom of the material and the button top down till you hear the snap and its locked. After it was all done, I decided to take it a step further. 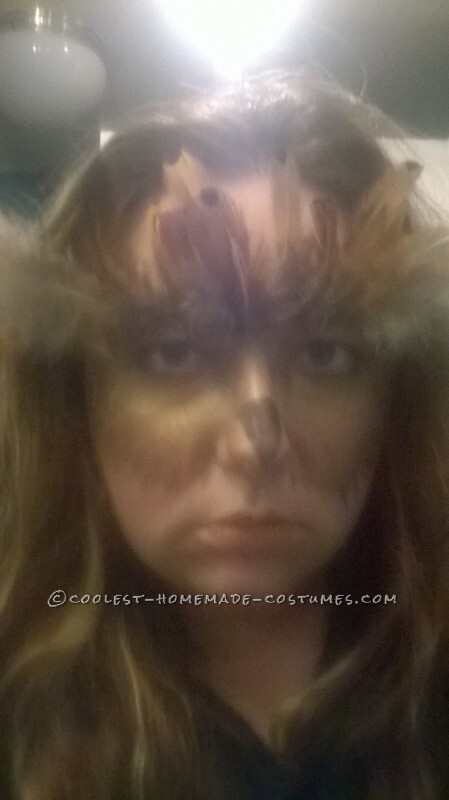 I got some face paint and started painting a owlish face on myself and then I used my son’s left over spirit gum from a previous year and glued feathers around my face to make it more realistic. I wore fur boots and brown leggings to top it off.